In February 2014, a series of violent events took place in the Ukrainian capital Kiev after Viktor Yanukovych, the former Ukrainian president, decided to suspend talks with EU after his meeting with Vladmir Putin. The protest developed into a regional conflict quickly and Yanukovych was ousted from his office by the Ukrainian parliament. In the meantime, Russia took aggressive steps by sending armies into Crimea and claimed the area after a Crimean referendum favored to join Russia. Russia’s occupation of Crimea has thrown a spotlight onto the peninsula. Located on the northern coast of the Black Sea, Crimea has great strategic importance to Russia. The Crimean port Sevastopol, home of the Black Sea Fleet, is crucial to Russian naval power in Mediterranean and beyond. Sevastopol has become even more important since Russia was forced to stop using its naval base in Tartus, Syria, due to the country’s civil war. 60% of the people in Crimea are native Russian speakers and most Russians regard Crimea as being mistakenly given to Ukraine by Sergey Khrushchev in 1954. The geographical position of Ukraine is also worthy of notice. Ukraine is the corridor between Europe and Russia; therefore, it’s necessary for Russia to keep Ukraine on their side in order to resist the influence of the EU. The Orange Revolution, from 2004 to 2005, was a turning point in Ukrainian politics. After Yanukovych was elected president in 2004, Viktor Yushchenko, backed by Yulia Timoshenko, denounced the election as fraud and agitated a civilian remonstration, which forced the Ukrainian Parliament to revoke the result and hold another election. Yushchenko won the reelection and Timoshenko served as the prime minister; however, fighting over political power, economic stagnancy, and government corruption undermined their leadership and Yanukovych was elected President again in 2010. Because Ukraine wasn’t an independent country until 1991, the Ukrainians still value ethnicity more than national identity. The Western and the Eastern parts have distinct political views, with the West inclined towards Europe and the East favoring Russia. 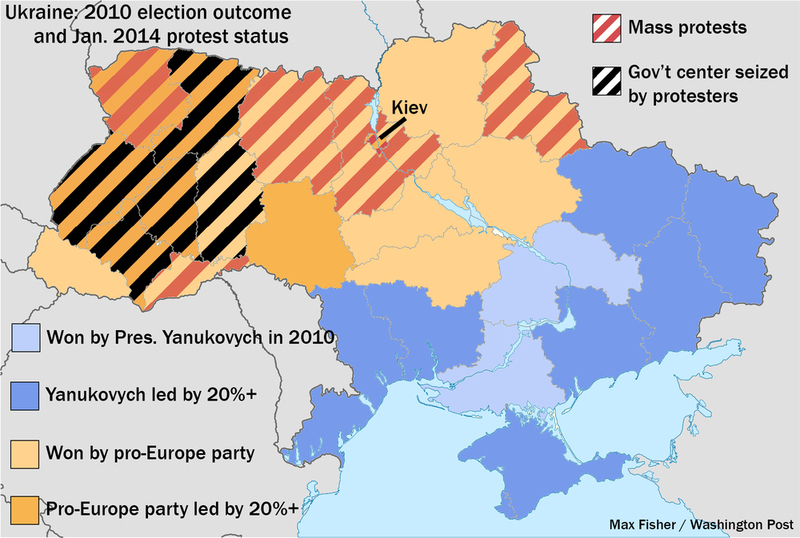 The election results of 2010 perfectly demonstrate the Eastern and Western controversy in Ukraine. Yanukovych was accused of committing treason by many Ukrainians, but there is absolutely nothing he can do to resist Russian orders. About one-third of the natural gas used in Western Europe comes from Russia and Ukraine is even more dependent on Russian resources. 80% of Ukrainian oil and 77% of Ukrainian natural gas must be imported mostly from Russia, which means Russia can manipulate Ukraine’s foreign policy and economy by simply altering the prices of oil and gas. Yanukovych is a conservative. He favored cooperating with Russia rather than with America and the EU. Russia gave Ukraine a discount on gas prices immediately after Yanukovych suspended talks with the EU, but Russia also stopped supplying gas to Ukraine for three years due to Yushchenko’s inclination toward America and the EU from 2006 to 2009. On March 20, many European leaders gathered in the Belgian capital Brussels to discuss topics like sanctioning Russia, boosting Ukrainian economy and—most importantly—getting rid of dependency on Russian oil and gas. Russia raised the price per thousand cubic meters of gas from 268.5 to 485 dollars in response, which exacerbated the collapsing Ukrainian economy. America and the EU are trying to find an alternate way to supply energy to Ukraine, and their conflict with Russia is going to continue. On March 16, Crimea voted to be Russian territory in a referendum. Ukraine, the EU, and America denounced the decision of the referendum as illegitimate and immoral. Russian Foreign Minister Sergey Lavrov, on the other hand, claimed that the referendum would be a starting point of Crimea’s future. According to results of the referendum, an overwhelming 96.7% of people approved of Crimea joining Russia; however, this referendum is illegal and its results can be misleading. First, the referendum clearly infringed on the Ukrainian Constitution. According to the Constitution, any affair involving sovereignty should be voted in a national referendum rather than a regional one. Furthermore, the referendum is poorly organized and might be manipulated by Russia. Russia has occupied Crimea with armed forces since weeks before the referendum and there was no strict enforcement in the voting. No information was given about the constituency of the board, the number of votes and the list of voters. Without this necessary information, the Russians could easily have manipulated the results. Also, the exact date of the referendum has changed multiple times, and there was no debate section. All these problems make people dubious about the validity of the referendum. On the other hand, America and the EU do not have the authority to put sanctions on Russia without the permission of the United Nations. America also has a double standard toward the Crimean and Kosovo referendum. America supported the Kosovo referendum while denouncing the Crimean one. American approaches to these affairs aimed at undermining Russian power, but they are mostly self-contradicting and questionable. The tension between Russia and the Western world will continue. Despite the UN’s effort to maintain peace, Putin’s aggression is going to continue and the American government will definitely react. Actively. Will the conflicts lead to a war? The answer is probably “No,” but these conflicts will have a profound influence on the polarizing political pattern of Eastern Europe.